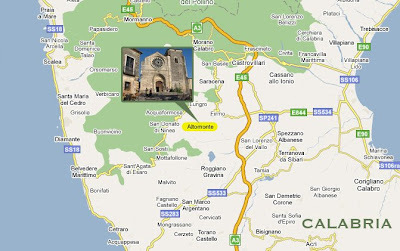 Amy's LA Wine Blog: Calabria wine? 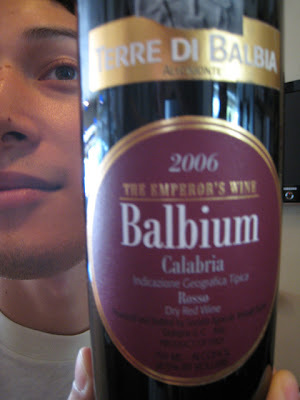 Jeff at Rosso Wine Shop sells this little Calabrian wine for $20.99. And its being poured at the wine bar THIS weekend. As in RIGHT NOW!! It's made from 100% Magliocco, don't ask me about that one, it's a first for me. It's all done in oak, but the oak doesn't contribute any of those vanilla "oaky" flavors, instead it just provides roundness to the wine. It's grapey and "delicious to the last drop" (says Jeff) Like all wines worth drinking, this wine is somehow linked to the Roman Empire. Aaron is pictured!!! He's wearing the Emperor's new clothes. Egidio just wrote to me that it's available at Terroni on Beverly as well, and you should definitely go there to see my beautiful friend, Christina, who works as a hostess there! Grazie mille. Lisa and her people thank you too. The list price on the Balbium is actually $20.99. And we are pouring it this weekend at the wine bar.